Take a look inside the latest issue of ImagineFX magazine - on sale now! 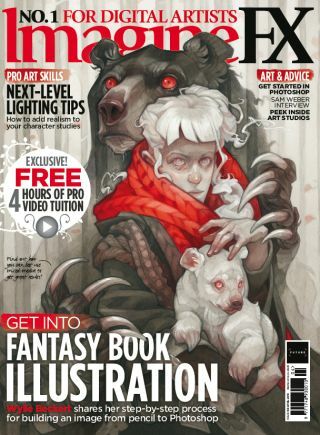 Discover the secrets to creating stunning fantasy book illustrations with the latest issue of ImagineFX magazine - on sale today. Inside issue 159 you'll also discover how creating fan art can lead to paying gigs, plus you'll learn how to develop designs for book characters. Buy issue 159 of ImagineFX here! On top of this, issue 159 is packed amazing artwork sent in by our very own readers, plus tips to help artists develop their core skills. Meanwhile, there's also all the latest news, tech updates and book reviews of what's big right now in the world of digital art. Check out this issue's headline features below. Plenty of artists pine after a studio that they can call their own, but Olivia Lomenech Gill went one step further and turned this dream into a reality. We catch up with her to take a tour of her eco friendly, hand built workspace. Sam Weber's art has been described as magical and mysterious, although the artist himself is weary of explaining his work. Instead, he uses stories to relay the importance of art in his life. We talk to him to hear his story in his own words. A relative late-comer to the genre of science fiction, Simon Stålenhag's art blends the rural delights of his native Swedish landscapes with fantastical elements such as robots. Here he explains why he wants to used science fiction to create art that means something. In this workshop detailing the making of our cover art, Wylie Beckert shares how to combine monochrome ink and pencil art with digital colours to create a haunting woodland scene. In the start of a new series all about Photoshop skills, Mark White shows you how to get to grips with the software's illustration tools before going on to show you exactly what they're capable of. Once you've got the basics of Photoshop skills down, it's time to take things further with this advanced Photoshop advice. Suzanne Helmigh is on hand to add some realism to your art with improved lighting techniques.